Researchers at the College of Engineering at Carnegie Mellon University have developed a novel design approach for exoskeletons and prosthetic limbs that incorporates direct feedback from the human body. The findings were published this week in Science. This technique, called human-in-the-loop optimization, customizes walking assistance for individuals and significantly improves energy economy during walking. The algorithm that enables this optimization represents a landmark achievement in the field of biomechatronics. 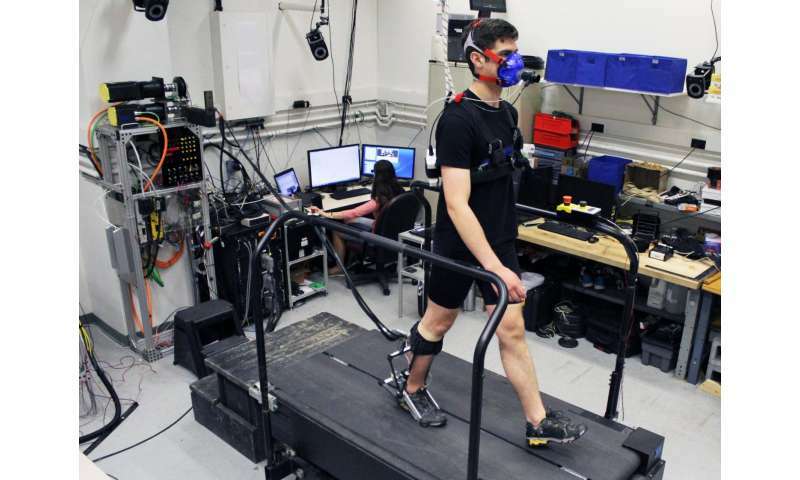 "Existing exoskeleton devices, despite their potential, have not improved walking performance as much as we think they should," said Steven Collins, a professor of Mechanical Engineering. "We've seen improvements related to computing, hardware, and sensors, but the biggest challenge has remained the human element—we just haven't been able to guess how they will respond to new devices." During experiments, each user received a unique pattern of assistance from an exoskeleton worn on one ankle. The algorithm tested their responses to 32 different patterns over the course of an hour, making adjustments based on measurements of their energy use with each pattern. The optimized assistance pattern produced larger benefits than any exoskeleton to date, including devices acting at all joints on both legs. "When we walk, we naturally optimize coordination patterns for energy efficiency," said Collins. "Human-in-the-loop optimization acts in a similar way to optimize the assistance provided by wearable devices. We are really excited about this approach because we think it will dramatically improve energy economy, speed, and balance for millions of people, especially those with disabilities."